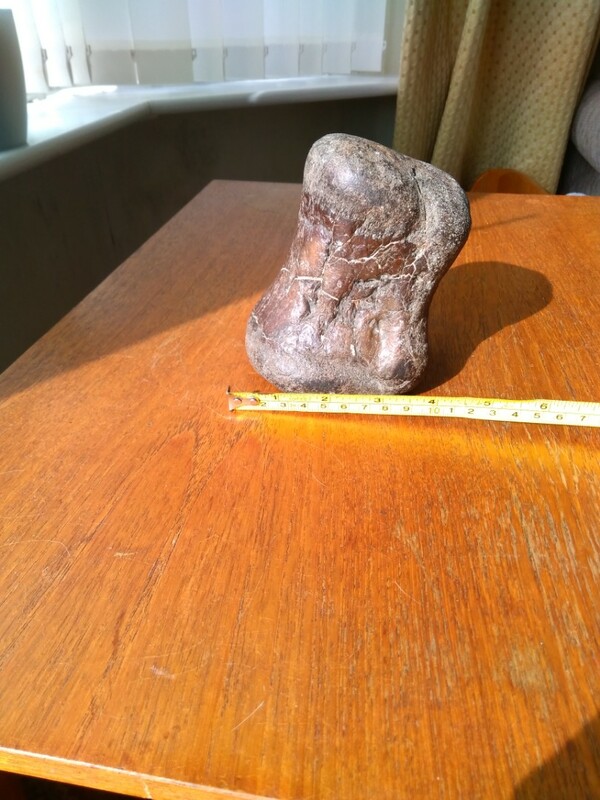 This fossil was found on the moors above Rochdale about 40 years ago. Apparently, at the time it was removed there were many other fossils in the same site but as far as I am aware, this was the only item removed. We have looked on the internet and the only similar fossil we have found is a metatarsal belonging to a Hydrasaur but these dinosaurs were only found in Canada making our assumption wrong. We would appreciate any further ideas about this find. Hello Susie and welcome to the forum. Hmmm.... bit of an enigma, the bedrock n the area is Carboniferous roughly 300 - 360 mya, far too early for this type of fauna! There are glacial deposits around, but would like a better location. I'm not the best person to answer your question, so hopefully someone else may be able to help you. This appears an eroded centrum of a vertebra, probably a dorsal. It looks water worn....as to ID I'd put as indeterminate dinosaur. But worth asking at a museum with a dino specialist. How it got where you found it is a mystery. Are you certain that's where it's from? Hi, and thank you both for your replies. The fossil was definitely found on the moors above Rochdale. 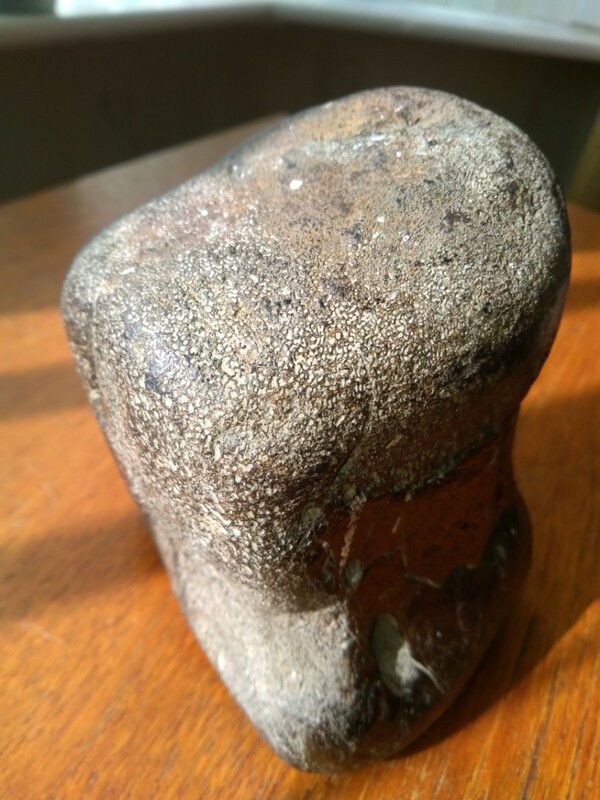 In fact my brother found it whilst digging the foundations for a house extension approx 30 years ago, but he also said that the householder had found similar pieces on the site. We have no idea what happened to them. Do you have any idea who I could contact for verification? The NHM London has an ID/enquiry service, email a pic to them with as much information as you can. Please come back with whatever they say. Hi Susie and Alan, There is a slight problem with that service online - it isn't in operation at the moment, it's been offline since August last year . I am a regular contributor to the rock & fossil forum. I would take it to a local university / museum who have experts in this field . I'm afraid I can't square the stratigraphical square as to how it got there! Didn't realise the service is offline, sorry about that. It did cross my mind that this could be from the Faringdon sponge gravels (? ), which I believe are quarried and used as base material for paths/roads etc. They contain derived Jurassic and Cretaceous fossils. My local golf course uses the stuff and I've come across belemnites, ammonite fragments and vertebrate remains including bones of marine reptiles and crocodile teeth in the stuff used for paths. The bones are a similar rusty orange to Susie's find. and 10 cm across. We have looked on the ordnance survey map and identified the location where it was found which is 265.4 mtrs above sea level, grid reference - SD90204 16379. My brother has suggested it came down with the ice age??? I am going to take it to our local museum and if that is limited I will contact Manchester Museum. I will keep you informed as I feel we have uncovered an enigma that needs investigating. 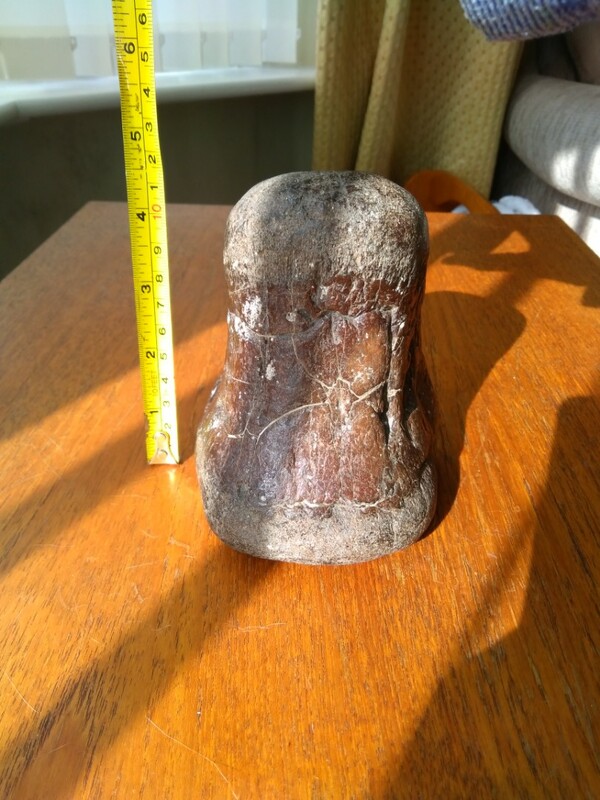 Could this be a Mammoth metatarsal?